I just wanted to let you all know that what you see of the Visual Novel Busts plugin isn't finalized for features. There will be more to come. Atlas system for busts to display expressions in a streamlined manner. Allow bust changes/control midway during a message window. Maybe Show Balloon can affect message busts, too. Compatibility with some other Yanfly plugins. I can't guarantee all of the ones on there, but I'm leaning heavily on it. When the time comes for me to update them, I will also increase the price of the plugin, too, because that's extra work added on at a later date. Those of you who have purchased the plugin already, don't worry, the price change won't affect you and your ownership of the plugin. I've already confirmed with the itch.io devs that this is the case. In fact, this is a way of saying thank you for supporting me from an earlier stage of the plugin. Originally, I planned to keep this plugin private because when I came into the community, I didn't see too many people using busts in their games. However, after sharing a few WIP screenshots, more of you expressed interest in it and asked if I could share it. But like said before, I don't know what much else I need to add to the bust plugin until I use it in an actual project, so here we are with this devlog to announce some updates. Hope this came off as informative to you current users and/or maybe future users wondering if they should invest in my work. 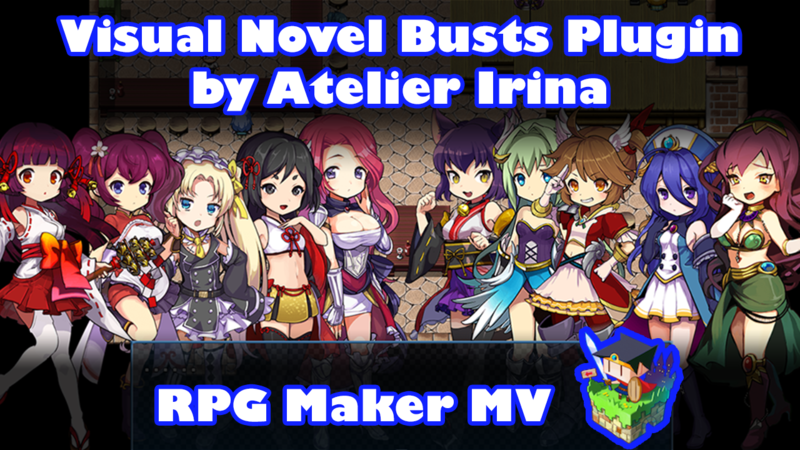 Adds visual novel style bust control for RPG Maker MV events.